Last night after drinks at ‘The Rock’ club I turned in, but unfortunately (for me) the party went on all night and the room was just over the club. I was not in the dorm because it was fully booked, but the Russian girl at the desk gave me and three other guys (we didn’t know each other) a private four bed room instead. This is because she promised us beds in the new dorm but although it was finished, it smelt too strongly of paint to be used. This was a good upgrade as the private rooms are much more expensive and she only charged us the dorm rate, but bad luck that we were over the club. I was also a little fed up of dorms (yes after only two nights in a shared room) so this morning I moved to the hostel where Maren and her friend stayed on the first night. They had also since moved from there because the wifi was bad, but I just wanted the private room so it didn’t matter. Today we decided to go snorkelling again. We wanted to see some turtles and we asked in a nearby diving shop if we could get a taxi boat to one of the bay’s that is known for turtles. They said that the sea was too rough for the taxi boat to be running today (just a bit choppy but they don’t take tourists out because they often get seasick, I have encountered the same thing in Chaina, Greece). But they suggested we go to shark bay where you can see small sharks and turtles. We walked down the road to get a taxi and an old lady offered us a taxi but we couldn’t find the car so the driver came and found us and walked us through a broken path/shortcut to the main road where the carb was parked. We flew off, a very bumpy ride on the back of an open truck going very fast (like many taxis on the islands). At shark bay there was an awesome reef which started right at the waterline. The water was very shallow, only up to my waist for about one hundred metres out to sea. I snorkelled for over an hour but I didn’t see any sharks or turtles. On my way back to the beach I asked another snorkeller if he had seen any sharks (these are very small fish sharks we are talking about here) and he laughed and said that you had to go out about two hundred and fifty metres to see any. It was still very shallow at that point but I didn’t want to go out that far so I went back to the beach. Maren’s snorkel mask had broken (it cost 100 baht so shows that it doesn’t pay to buy a cheap one) so they hadn’t snorkelled for very long. I lent her mine and they went back in the water while I read my book. We hadn’t brought any food with us but the only place to eat was a posh hotel restaurant by the side of the beach. I ended up buying a fruit smoothie to tide me over because I was very hungry. It cost me 140 baht which is about £3 GBP, so still a lot cheaper than at home but very expensive for Thailand. The average price is normally between 20 baht (in the north) and 80 baht (in the south). We called the number that the taxi driver gave us, they like to give you their number in the hope that your will call them every time you need a taxi. Back in town we decided to book our tickets for the ferry to Ko Phangan the next day at a one of the many tour offices. We went out for a light dinner. Maren’s friend had a touch of food poisoning so we didn’t stay out late. Today we had to be up early to catch our ferry. I was a little late and I think the girls were a bit annoyed about that :p. We were supposed to be at the ferry pier for 9am but I know from before that this is just a guideline. We arrived at about 9.15 am with plenty of time to spare (in my opinion anyway :p ). The ferry company stickered us, they love their stickers, ours said ‘Koh Phangan‘ in orange. (Maren’s friend was off to a different island so we said goodbye to her). This time it was the company Lomprayah that we were using, not the same as the one I arrived with. I think Lomprayah is the fastest service, with the trip to Ko Phangan taking only 45 minutes rather than 1 1/2 hours. Our bags were loaded, last as we were the first stop. The ferry was already very full because we were loaded last but we managed to get some seats on the middle deck outside. This was because there was water dripping down onto the seats from above, and they were the only empty ones but that was lucky for us and I didn’t mind the water. There was a really good view of Ko Tao as we sailed away from it and it sort of does look like a turtle from a distance. Tao means turtle in Thai and Ko means island. We got a songtheaw (with a few other people) from the pier to our hotel. Maren had done a lot of reading about Ko Phangan as this is her last week and she wanted to find the perfect place to stay. 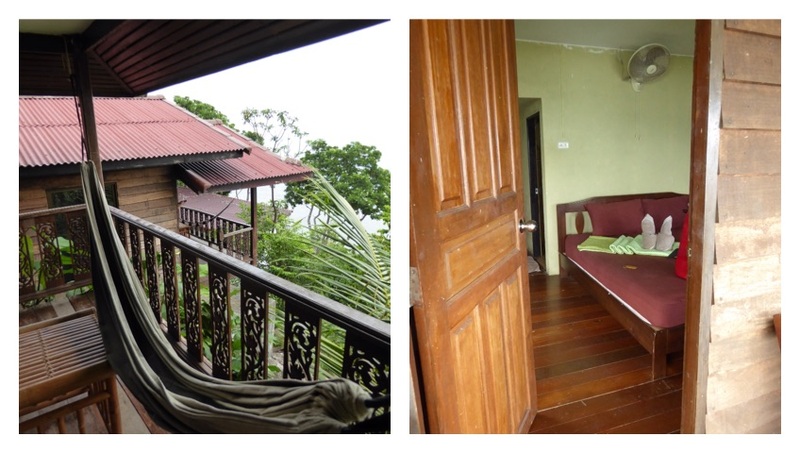 The place was called High Life Bungalow and was a highly recommended flash packer hotel. It consisted of many bungalows on stilts built on various levels right on the beach at Haad Yao. Haad means beach in Thai and Yao means long. Maren had a budget of 900 baht a room (I didn’t but I was just waiting to see what happened when we got there) but it turned out that their cheapest room was with fan and only 500 baht! We got our own private bungalows with balconies and hammocks. Both bungalows had awesome beach views. These are our huts (Maron’s was below mine, all the huts were staggered at different heights). We realised later in the week that the rooms were also cheap because the wifi didn’t reach our huts as our were the furthest from the router but we just used it in the restaurant and reception. The hotel had an awesome infinity pool as well. Beautiful! We spent the afternoon by the pool after lunch at the restaurant. The food was very well priced considering it was Ko Phangan (the popular backpacker party island). Here is a picture of the awesome pool! Next up: days twenty-two and twenty-three. Recent related posts: lightening the load – stuff I posted home – packing light update. Today for breakfast I decided to eat the cereal that I bought last night in the supermarket, then I packed and reevaluated my bag. I packed it all up in my satchel and walked out to the road to catch a taxi to the post office, which I had looked up and was quite nearby on Google maps. The taxi wanted me to pay 300 baht which was ridiculous so I walked a bit further and found a motorcycle taxi to charge me 150 baht, which is still quite a lot of money but I couldn’t be bothered to haggle for less than a pound, which is what the difference would have been. So this guy took me to the post office all the way he kept asking me if I wanted to buy a wife and if I wanted him to take me to all the different waterfalls and/or other attractions on the island. I kept saying no, ‘mai krap, mai krap’ over and over. At the post office I purchased a box for 25 baht and tied it up with string which came free with the box. I went to the counter, you had to take a paper ticket and wait for your number to come up on the screen. I asked for two weeks delivery air mail because I decided that would be best for the parcel to be in the post for the shortest amount of time possible. I didn’t have enough cash so the taxi guy drove me down the road to the nearest ATM and then we returned to the post office and I paid. Off it went so fingers crossed that it gets there okay. Just to mention that I used the official Thai postal service not one of the many courier companies that operate in Thailand. In this post you can read more about the things I have posted home. Outside the post office it was really hard to explain to the taxi driver where I wanted to go, (back to the same place that he picked me up) because he kept offering to take me to the waterfalls and other places, it was really hard to get him to understand. I eventually managed to explain by miming putting on a helmet, because shortly after he picked me up, he stopped by his house to put on his helmet. This is because it’s the law here that one person has to wear helmet while on a motorbike (but only when you have two people on the bike, if you just have one person they don’t have to wear a helmet, crazy much). Anyway he finally realised that I wanted him to take me back there (to near where he picked me up). On the way back he talked animatedly about his favourite football team Man United. They are very popular with Thai people over here I have no idea why but anyway. I walked from his house back to my hotel and packed the rest of my stuff. I then left the keys on the bed because the pizza restaurant doesn’t open till 1 PM and the reception was closed. I then went out to the road to get a taxi to the ferry port. I asked in the tourist office but she said it would cost me 300 baht because it was too late for me to join the cheaper bus to the pier, so I got another motorcycle taxi. Again the driver spoke very little English but hummed all the way and pointed and laughed at random signs on the way for some reason. At the pier I had a smoothie in the cafe next door and then caught the boat. On the boat they were playing Mr Bean videos on the large screen TV. The journey was about 1 1/2 hours. 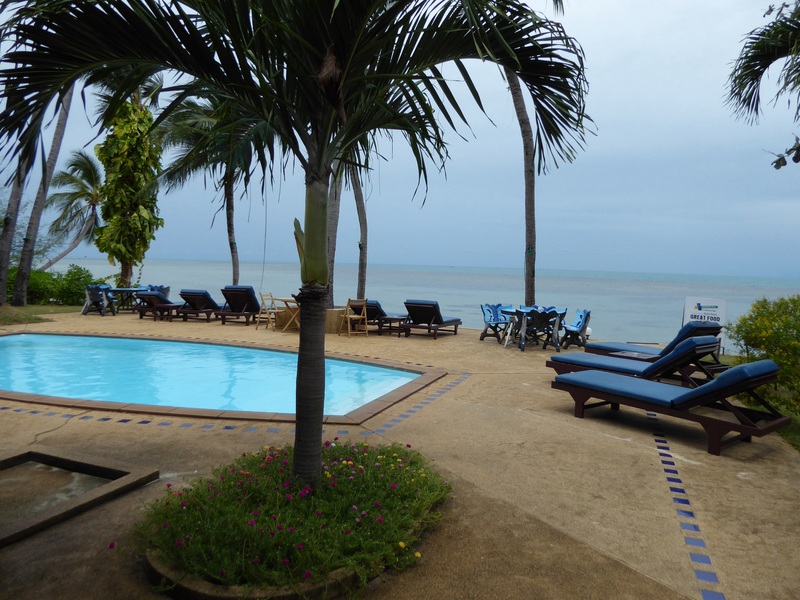 When I arrived at Ko Tao I got another drink in a cafe to use the Wi-Fi and messaged Maren my German friend to arrange to meet her at her hostel. I walked 15 minutes, as she told me, to her hostel but they weren’t there. They had checked in but I wasn’t able to get in contact with them. I asked how much for a room and the guy told me 600 baht a room, it was only 300 baht for them because they were sharing but I would’ve had to pay 600 for same size room. I tried to haggle as recommended by another backpacker I met the other day but no luck. I walked two minutes back the way I came until I found a hostel called ‘Goodtime Adventures‘, the Russian girl at the reception showed me a dorm rooms which were mixed rooms for 400 baht a night. They were nice, very modern, with air-conditioning and a lockbox. I decided to stay there and the girl let me even though she had been asked not to check in any more guys to the mixed dorm (they like to have a balance, a bit like in the UK if you rent a cottage they like to have a mixed group). I ordered a burger at my hostel bar right on the beach and read my book, 1984 and later I managed to meet Maren and her friend and we went for drinks at one of the many bars overlooking the beach. It was really nice to catch up with Maren and hear all about her trip to Cambodia. Today I got up at 8am and walked up to 7-11 to buy breakfast. I was planning on moving hostels today but in the end I couldn’t be bothered. I sat in the common room and finished 1984. I had forgotten how depressing the end is but it is still one of my favourite books. I left it on the book-swap shelf in the hostel. We were planning on going to the beach but I didn’t really have a suitable bag, so I went to one of the diving shops a few doors along and purchased a 15 litre dry bag. It has a shoulder strap and is very sturdy, more like a beach bag. I have seen a lot of backpackers carrying them around this morning. It was very handy today and I could just throw it down on the beach and not think about my stuff getting sandy etc. Met up with Maren and her friend and we walked to Aow Leuk beach which took about half an hour. We were passed by lots of cars who (as usual if you walk anywhere in Thailand) found it hilarious that we were walking. We found the beach fairly easily despite the tourist cartoon map being very out of proportion :p The map showed two main reefs for snorkelling on this beach but one was roped off for a scuba diving school. The other side had a handful of other snorkelers swimming about but was not crowded. We saw some awesome fish. It was a decent reef with a good variety of fish, nothing rare but we did see a couple of really big ones (about a foot long), and some lovely electric blue and yellow fish. We walked back changed and showered and then met again in the evening for dinner. We also met up with two other German girls from the travellers Facebook group and we all went for drinks at ‘The Rock’, the club next to my hostel. It was very busy and typical of any club (back home) with disco lights and rave musics. We sat on the beach part of the club where the music was quieter and saw some good firethrowing displays. Two of the four guys (doing the display) were throwing their fireballs (on string) to each other, one on the beach and one on the top of the rock (literally a massive rock that the bar is named for). Tomorrow we are going to check out some of the other bays that are supposed to be good for snorkelling. No pictures again sorry but as I am actually on day 49 in Thailand (in real time) I can promise that in a few ‘days’ time there will be pics again. Previously: days sixteen and seventeen. Today I decided to move on to Chaweng beach as Silja described it as livelier than Lamai, which, although nice to relax on, is pretty dead out of season. Check out was 12pm, but they said, as there was no one coming into my room, I could check out at 2pm. After packing I took a walk to the bookshop and sold back the book I had read and bought another. I checked out at about 1pm and got a songthaew to Chaweng beach for 100 baht. The car was full of other people over half of whom where backpackers. The car drove through the Chaweng area, some of which I recognised from yesterday. I kept waiting to see if it got to the busiest area but it was hard to tell. In the end we came to a straight empty road again and the last building was a large mall called Festival Hall. I pressed the button then and the next to last customers, two other backpackers got out too. They were from Ireland. We laughed when they said they were also waiting to get off at the centre of Chaweng but couldn’t tell where that was. We sat in a cafe in the mall. It was a big place, like the Bentall Centre in Kingston near where I live (this reference is for my family back home), but more modern, the shops and brands here were very similar as well. We could have been in a shopping centre the UK or easily in a mall in the USA. They needed WiFi to find a hostel on trip advisor, I said I was just going to walk until I saw somewhere. They thought that was a good idea but the girl (I think they were a couple) had trodden on a Black Sea anemone a couple of days ago and couldn’t really walk on it. She said they had been to a pharmacy but they had just laughed her away, marking her off as a daft tourist. There are signs warning people about the anemones on the beach. I hope she managed to get it sorted, you could see the black spines all stuck in the sole of her foot like giant splinters. Ouch! I took a look in a phone shop but concluded that it wasn’t worth me getting a phone here. They had some cheap ones but I will save my money for a new iPhone when I get home. I walked back into Chaweng beach area and found a hostel called ‘Urban Guesthouse’ over a pizza place. I had lunch and spent some time on the beach, the sand was lovely and soft compared to Lamai beach. I met Silja and a friend of hers for dinner in the night market (a bit like in Chiang Mai, see this post, but more expensive/touristy). We then went round a clothes and gift market outside the Festival Hall mall and then spent the evening on the beach and popped in and out of a few beach bars. We didn’t go in the most popular ones (for example the ‘Ark Bar’ because they were too expensive). On my way back to my hostel I bought a snorkelling mask and tube in a dive shop. I love snorkelling, having tried it on a lovely coral reef in Tanzania, Africa, and having my own mask will give me the freedom to try snorkelling on Ko Tao without having to pay for a tourist trip every day. This morning it was quite strange. I got up at 9am and went downstairs but the joining door that leads to the restaurant, that I was using last night, was locked! There was no light and I spent ages fumbling about in the dark. In the end I found a door to let me out but I had to turn sideways to fit down the alley. Once outside, the place was like a ghost town, I saw one old guy sitting on the floor and he looked astounded to see anyone out at that time in the morning! I have now gathered that no one gets up in Chaweng beach area until about 11am when shops start opening, and then most shops open at 1pm. It was very odd, but that’s a beach town for you. It’s not even an activity town just a laze on the beach town, so that’s probably why. Anyway after walk on the beach and breakfast from 7-11 (nothing else was open), I went back to my room for my snorkel gear. I then left all my valuables, ipad, passport and emergency money in the hostel! This is the first time I have done this and I now do this more often. It was the best place to start, it was so safe because I was the only guest and no one would be able to find the door to get into the building and then they would never have been able to find my room in the dark. I have since read on trip adviser and there are amazing reviews for the pizza in the restaurant but most people said the guest rooms weren’t in use or were still being built, it’s finished now but is just a sideline of the restaurant. So I tried my snorkel set at the beach and it was very good quality but I couldn’t see anything because the water was very murky. I know the best snorkelling is on Ko Tao so fingers crossed for that. I spent the day on the beach and finished my book and then I met Silja again in the evening. We went to the second night market and I ordered meat skewers and a fruit shake. We wandered around the area and ended up in a non chain supermarket, my first supermarket here in Thailand. They had every brand in the world here, Nutella, every brand of chocolate in the world, including the American Hersheys which we can’t easily get in the UK. You could buy cocopops and even scrabble the board game! It was just daft. Said goodbye to Silja as she was off early the next morning to catch a bus/train to Krabi which is further south. Back at my hotel I had my first Skype conversation with mum and dad since I have been here. 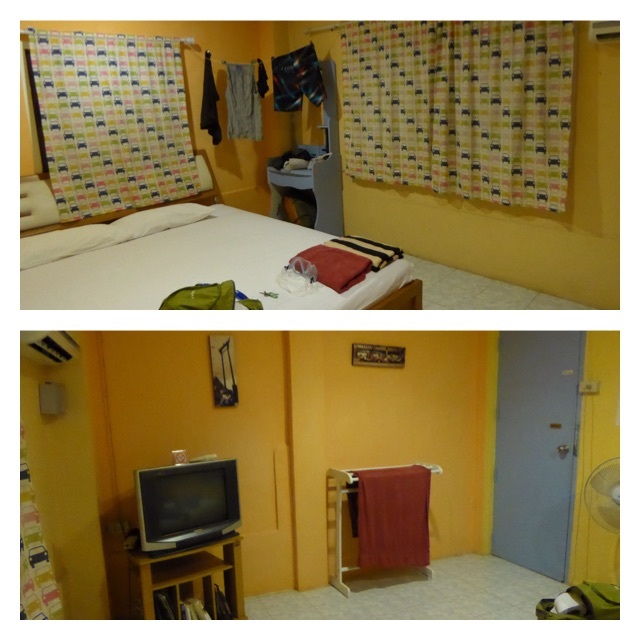 Only a couple of pics of my hostel room because I didn’t take any other pictures in Chaweng. This room is very typical of all the rooms I have stayed in in Thailand. Next up: days eighteen and nineteen. Previously: days fourteen and fifteen. Today I spent a relaxing by my hotel pool and ordering food from the hotel bar. It felt very luxurious, being able to order whatever I wanted, only glancing at the price, confident that nothing will cost me more than £5. I spent some time on Facebook on some groups that Maren told me about. 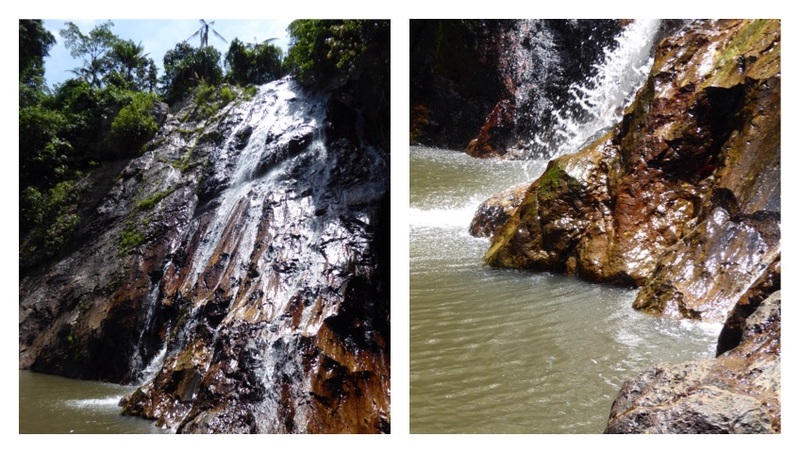 I arranged to meet a Danish girl called Silja the next day, to visit the Na Muang waterfalls together. This is my third night at the Weekender Villa. 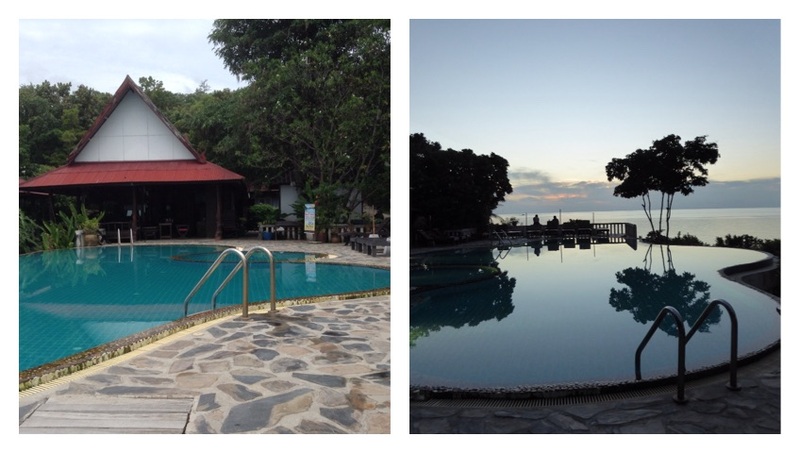 In the morning I walked out into the road to hail a songthaew or taxi to Chewang beach where Silja was staying. A taxi stopped and I asked for the price for a round trip to the waterfalls as well, he quoted me 1000 baht which is ridiculous. Next a songthaew stopped and he said 600 baht which we would then split. I was happy with that as I am not on a really tight budget yet and my share, 300 baht would be about £6 GBP. It took the songthaew a long time to find the place in Chewang beach that I showed him on the map, we had to stop at least half a dozen times to ask his friends (other taxi drivers with no customers as of yet, who were laying about by the side of the road) where to go. When I finally got to Silja’s hotel it was 10.30am. We both got back in the songthaew for the drive to the waterfalls. Silja thought 600 baht was a lot of money, she is more experienced in what things cost over here, having stayed in Thailand before two years ago. On arrival at the waterfalls she haggled him down to 500 baht and then he wanted 400 which we would pay him for the return trip at 2pm. We walked to waterfall one which was quite nice, and flowing nicely despite the water shortage (it is only the very start of the rainy season here). There were lots of butterfly’s around. The second waterfall was a 30 minutes walk away, I was glad to do some walking, it is so hot here no one walks anywhere and I miss walking. The second waterfall was packed with tourists having their pictures taken so we waded through to the other side where there was a cafe. We had an ice cream, there is also a water slide here which is a bit daft. I would be quite happy coming to see the natural phenomena, no one was using the slide anyway :p.
We got back down to meet out songthaew for 2pm but he wasn’t there (we hadn’t paid him so we didn’t lose any money) I suggested he was on ‘Thai time’ so might be late but Silja said that her experience would suggest that they are normally on time to pick up tourists. Anyway he did us a favour because we took a causal walk along the road and got some snacks from 7-11 and ended up hailing another songthaew who only wanted 150 baht to take us to our two destinations, Chewang beach and Lamai beach. Later that evening it rained very heavily and the power was shorted at my hotel for a couple of hours. I noticed the air con was off and asked at reception. They said it was because of the rain. No one seemed that bothered, it is very relaxed here, and the power came back on again anyway. Pictures of waterfall one are below. Next up: days sixteen and seventeen. Previously: days twelve and thirteen.